Damn, Revlon! Quit coming out with so many fantastic lip products that I love! After the Colorburst Lip Butter craze consumed me, I thought I would be satisfied. If only. I just spotted these pretties on Ulta's site, and I am once again having strong feelings of desire. The Revlon Color Burst Lipgloss Limited Edition Holiday appears to be part of their Spice It Up collection that I saw on Nouveau Cheap and Steph's Closet. I thought I was safe when I saw their display pictures, until I spotted them again on Ulta and made the mistake of clicking the zoom button! Decadent is one I must have, and there's several others that look interesting to me. Ulta's zoom feature is also to blame for the fact that I may need some of the nail polishes in this Holiday collection. Right now they're buy one get one half off at Ulta, and I believe Revlon is on sale at Walgreens starting tomorrow, also buy one get one half off. I've found a $1.oo off Revlon coupon in People Magazine's last two issues, and it would be a shame to let those expire now, wouldn't it? 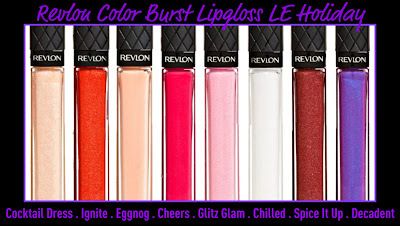 Haha I share your sentiment about how Revlon needs to quit such amazing, tempting products =p I'd love to see a swatch of Decadent, that color looks really awesome! Wow look at that purple one! I'm a huge fan of purple lipcolors, so I think I may need to pick that one up! Mary, when did you change your picture? Just noticed it. Looking gorgeous as usual. Don't tempt me so! I just bought a set of Tarte cosmetics from QVC the other day. A blush, big lip pencils & brush. I was putting them away & looking through all the stuffed cosmetic bags I have. I don't even want to start to count the amount of lip products I have. Two big bags alone of glosses. One is just the Juicy Tube types. I feel sick when I see it all & also happy! Yet I still want all the new stuff I see. Revlon, for the most part, has always managed to put out wonderful things (especially for the lips) in my opinion. I agree that Decadent is a must have, but I needn't be tempted right now. Thanks so much for this post!! I had all these colors...ALL BUT ONE (glitz & glam) when I raided a "Spice It Up" display. I would not have realized that glitz & glam existed if not for this post.